An analyte sensor including an antiglycolytic agent or a precursor thereof and a chelating agent that stabilizes the antiglycolytic agent positioned proximate to the working electrode of the sensor. Also provided are systems and methods of using the electrochemical analyte sensors in analyte monitoring. This application is a continuation-in-part, and claims the benefit of priority of U.S. patent application Ser. No. 11/322,165, filed Dec. 28, 2005, now published as U.S. Patent Publication No. 2007/0149875, which is incorporated herein by reference. As attention to analyte monitoring continues, there is an interest in analyte monitoring protocols that do not exhibit, or at least minimize, spurious low readings, e.g., spurious readings following device placement in a user and/or thereafter such as during the night. Spurious low readings may be caused by the presence of blood clots also known as “thrombi” that form as a result of insertion of the sensor in vivo. Such clots exist in close proximity to a subcutaneous glucose sensor and have a tendency to “consume” glucose at a high rate, thereby lowering the local glucose concentration. Of particular interest are analyte monitoring compositions and protocols and that are capable of substantially immediate and accurate analyte reporting to the user so that spurious low readings, or frequent calibrations, are minimized or are non existent. Embodiments of the invention include electrochemical analyte sensors having an antiglycolytic agent or a precursor thereof and a chelating agent that stabilizes the antiglycolytic agent positioned proximate to the working electrode of the sensor. Also provided are systems and methods of using the electrochemical analyte sensors in analyte monitoring. Other embodiments of the invention relate to methods and devices for monitoring of the level of an analyte using an in vivo or in vitro analyte sensor, e.g., continuous and/or automatic in vivo or in vitro monitoring using an analyte sensor. Embodiments of the subject invention include sensors that do not exhibit, or at least have a minimal period of time in which, spurious, low reading are observed. The subject invention may be employed to minimize or eliminate spurious low analyte readings obtained at any time during sensor use, including a period of time immediately after sensor activation (e.g., positioning of an analyte sensor in or on a patient) and/or anytime thereafter. Embodiments include sensors in which at least a portion of the sensor is adapted to be positioned beneath the skin of a user and which are adapted for providing clinically accurate analyte data substantially immediately after the sensor has been operably positioned in a patient (e.g., in the subcutaneous tissue, etc.) and/or without substantial interruption due to spurious analyte readings. Embodiments of the subject devices include devices (e.g., analyte sensors) that include an antiglycolytic agent or precursor thereof and one or more chelating agents. Such chelating agents may include borate minerals, boric acid or an equivalent compound. Also provided are methods of determining the concentration of an analyte in bodily fluid, where embodiments include determining the concentration of an analyte in a bodily fluid without any, or with only a minimal period of time in which spurious, low readings are observed. Embodiments include positioning an analyte sensor in a patient and determining, with clinical accuracy, the concentration of an analyte in bodily fluid substantially immediately following the operable positioning. Embodiments of the subject methods include contacting an antiglycolytic agent or precursor thereof in combination with one or more chelating agents to an analyte determination site, and determining the concentration of an analyte at the site. Embodiments of the subject methods include operably positioning a device (e.g., an analyte sensor) that includes an antiglycolytic agent or precursor thereof and one or more chelating agents in a patient, and determining the concentration of an analyte using the sensor. Also provided are methods of stabilizing an antiglycolytic agent with one or more chelating agents for use in an analyte biosensor. Embodiments of the subject methods include coating an analyte sensor containing an antiglycolytic agent or precursor thereof with one or more chelating agents such as borate minerals, boric acid or an equivalent compound. In other embodiments, an analyte determination site may be contacted with an antiglycolytic agent or precursor thereof and one or more chelating agents such as borate minerals, boric acid, or an equivalent compound, prior to determining the concentration of an analyte at the site. Also provided are methods of manufacturing an electrochemical sensor comprising an antiglycolytic agent or a precursor thereof and a chelating agent positioned proximate to the working electrode of the sensor, including, but not limited to, formulation in the sensing layer, deposition over the surface of the sensing layer, formulation in the membrane, deposition over the membrane, deposition on the surface of the sensor, such as the working electrode, and the like. FIG. 18 shows the effect of stress on glucose biosensors with and without the addition of boric acid. Boric acid and L-glyceraldehyde are incorporated into the outer membrane of the biosensors. The high background current is significantly reduced when boric acid is added to the membrane formulation. Throughout embodiments of the application, unless a contrary intention appears, the following terms refer to the indicated characteristics. A “biological fluid” or “physiological fluid” or “bodily fluid”, is any bodily fluid in which an analyte can be measured, for example, blood, interstitial fluid, dermal fluid, sweat, tears, and urine. “Blood” includes whole blood and its cell-free components, including, plasma and serum. 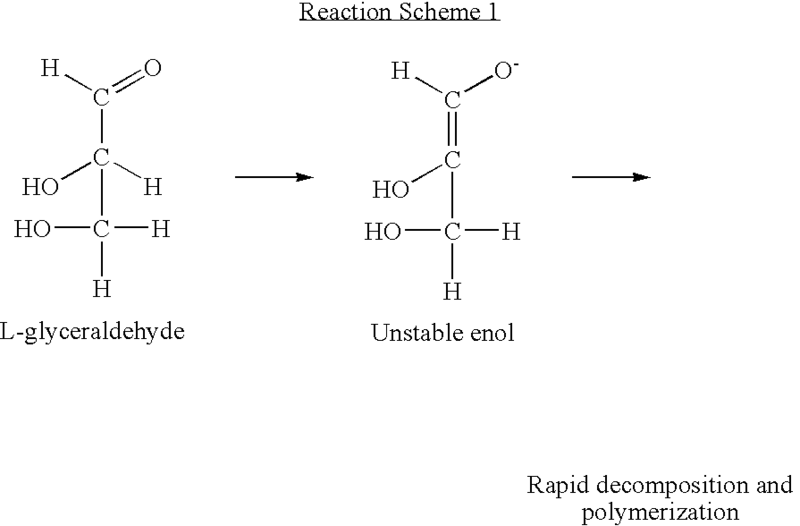 As exemplified in Reaction Scheme 1, the antiglycolytic agent L-glyceraldehyde transforms to an unstable enol under stressed condition, and decomposes rapidly to generate undescribable polymeric mixtures. As shown herein, the above reaction is prevented by adding a chelating agent, e.g., borate, which stabilizes the antiglycolytic agent and prevents the rapid decomposition and rapid polymerization of the antiglycolytic agent. 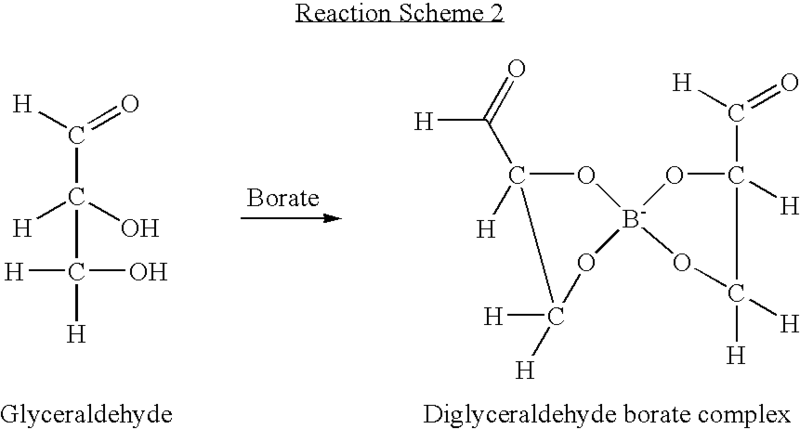 For example, a molecule of borate and two molecules of L-glyceraldehyde will form a diglyceraldehyde borate complex, as shown below in Reaction Scheme 2, which is a stabilized complex that does not decompose and rapidly polymerized as compared to the absence of the chelating agent. Embodiments of the invention include devices that include an antiglycolytic agent or precursor thereof and a chelating agent that stabilizes the antiglycolytic agent or precursor thereof, e.g., analyte sensors that include an antiglycolytic agent or precursor thereof and a chelating agent. The antiglycolytic agent or precursor thereof and the chelating agent are collectively referred to herein as “active agent”. The term “antiglycolytic” is used broadly herein to include any substance that at least retards glucose consumption of living cells. The antiglycolytic agents or antiglycolytic agent precursors may be any suitable antiglycolytic agents or precursors known or to be discovered. Examples of antiglycolytic agents include, but are not limited to, fluorides, glyceraldehydes, mannose, glucosamine, mannoheptulose, sorbose-6-phophate, trehalose-6-phosphate, maleimide, iodoacetates, and the like, and combinations thereof. Examples of antiglycolytic agent precursors include, but are not limited to, enzymes, e.g., trehalose-6-phosphate synthase, and the like. For example, the antiglycolytic agent may be glyceraldehydes, e.g., D-glyceraldehyde, L-glyceraldehyde, or a racemic mixture of D- and L-glyceraldehyde. As noted above, fluorides may be used, e.g., sodium fluoride, potassium fluoride, etc. Chelating agents, as used herein refer to compounds capable of forming two or more coordination bonds with organic compounds, thereby stabilizing the organic compounds from degradation and decomposition. Examples of chelating agents suitable for use in the embodiments of the invention include, but are not limited to, borate, boric acid, main group metals, such as Ca(II), and transition metals, such as, Cu (II), Zn(II), Co(II), V(IV), Mn(II), Ni(II), Fe(II), and the like. Additional chelating agents that are capable of stabilizing the organic compounds from degradation and decomposition include the Group IIIA metals, such as Al, Ga, In, and Ti. The amount of active agent included in a sensor may vary depending on a variety of factors such as the particular active agent used, the particulars of the sensor, etc. In any event, an effective amount of active agent used—an amount sufficient to provide the requisite stabilized antiglycolytic result for the desired period of time. By way of example, in embodiments using L-glyceraldehyde as an antiglycolytic agent, the amount of L-glyceraldehyde may range from about 1 microgram to about 2 milligrams, e.g., 10 micrograms to about 200 micrograms. By way of example, in embodiments using boric acid as a chelating agent, the amount of boric acid may range from about 0.1 microgram to about 1 milligrams, e.g., 1 micrograms to about 100 micrograms. As will be appreciated by one having skill in the art, each element of the active agent may be present in equal quantities or in different quantities, depending on the specific antiglycolytic agent and chelating agent selected for use. Embodiments of the invention are applicable to an analyte monitoring system using a sensor at least a portion of which is positioned beneath the skin of the user for the in vivo determination of a concentration of an analyte, including glucose, lactate, and the like, in a bodily fluid. The sensor may be, for example, subcutaneously positioned in a patient for the continuous or periodic monitoring an analyte in a patient's interstitial fluid. This may be used to infer the glucose level in the patient's bloodstream. The sensors of the subject invention also include in vivo analyte sensors for insertion into a vein, artery, or other portion of the body containing fluid. A sensor of the subject invention may be configured for monitoring the level of the analyte over a time period which may range from hours, days, weeks, or longer, as described in greater detail below. Embodiments of the invention also apply to an in vitro analyte monitoring system. For example, a system in which bodily fluid is obtained and contacted with an analyte sensor above the skin. Such systems include, but are not limited to, skin opening (e.g., a laser, lancet, or the like) and sampling devices adapted to determine the concentration of an analyte in a sample of bodily fluid obtained from the skin opening, e.g., by periodically or continuously sampling fluid exuded at the site. The skin opening device and sampling device may be integrated in a single unit or otherwise. Embodiments of the invention are described primarily with respect to an analyte sensor in which at least a portion of which is operably positioned under the skin of the patient, where such description is for exemplary purposes only and is in no way intended to limit the scope of the invention in any way. It is to be understood that the subject invention may be applicable to different analyte sensors, e.g., above-skin analyte sensors. The active-agent containing devices may be analyte sensors in certain embodiments, or may be a structure that is positionable near an analyte determination site (a bodily fluid sampling site), e.g., near an analyte sensor such as near a wholly or partially implantable sensor. In certain embodiments, the structure may be a sensor insertion device, drug delivery device (e.g., insulin delivery device), etc. In certain embodiments, the active agent-containing device may be an active agent delivery device. In further describing the subject invention, the invention is described primarily with respect to an active-agent-containing analyte sensor, where such description is for exemplary purposes only and is in no way intended to limit the scope of the invention in any way. It is to be understood that an active agent may be associated with devices other than analyte sensors or otherwise contacted with an appropriate area of a patient. In certain embodiments, the active agent may not be carried by a device, i.e. independent of the device, but rather may be otherwise applied at or substantially near the analyte determination site on the skin of a subject, such as the forearm, abdomen, and the like. Accordingly, embodiments include systems having an active agent delivery unit and an analyte sensor. In such embodiments, the active agent is formulated for transdermal delivery by a topical route, such as topical application to the skin of a subject. The active agent employed in the subject invention may be delivered transdermally, by a topical route, formulated as applicator sticks, solutions, suspensions, emulsions, gels, creams, ointments, pastes, jellies, paints, powders, and aerosols. For example, embodiments may include an active agent in the form of a discrete patch or film or plaster or the like adapted to remain in intimate contact with the epidermis of the recipient for a period of time. For example, such transdermal patches may include a base or matrix layer, e.g., polymeric layer, in which active agent is retained. The base or matrix layer may be operably associated with a support or backing. Active agents suitable for transdermal administration may also be delivered by iontophoresis and may take the form of an optionally buffered aqueous solution that includes the active agent. Suitable formulations may include citrate or bis/tris buffer (pH 6) or ethanol/water and contain a suitable amount of active ingredient. Active agents of the subject invention may be adapted for parenteral administration, including intravenous (“IV”) administration, intramuscular (“IM”), subcutaneous (“SC” or “SQ”), mucosal. The formulations for such administration may include a solution of the active agent dissolved in a pharmaceutically acceptable carrier. Among the acceptable vehicles and solvents that may be employed, include, but are not limited to, water and Ringer's solution, an isotonic sodium chloride, etc. Active agent may be formulated into preparations for injection by dissolving, suspending or emulsifying them in an aqueous or nonaqueous solvent, such as vegetable or other similar oils, synthetic aliphatic acid glycerides, esters of higher aliphatic acids or propylene glycol; and if desired, with conventional additives such as solubilizers, isotonic agents, suspending agents, emulsifying agents, stabilizers and preservatives. These solutions are sterile and generally free of undesirable matter. Embodiments may also include administration of active agent using an active agent delivery device such as, but not limited to, pumps (implantable or external devices and combinations of both (e.g., certain components may be implantable and others may be external to the body such as controls for the implantable components), epidural injectors, syringes or other injection apparatus, catheter and/or reservoir operably associated with a catheter, etc. For example, in certain embodiments a delivery device employed to deliver active agent to a subject may be a pump, syringe, catheter or reservoir operably associated with a connecting device such as a catheter, tubing, or the like. Containers suitable for delivery of active agent to an active agent administration device include instruments of containment that may be used to deliver, place, attach, and/or insert the active agent into the delivery device for administration of the active agent to a subject and include, but are not limited to, vials, ampules, tubes, capsules, bottles, syringes and bags. Embodiments may also include administration of an active agent via a biodegradable implant active agent delivery device. Such may be accomplished by employing syringes to deposit such a biodegradable delivery device under the skin of a subject. The implants degrade completely, so that removal is not necessary. Embodiments may include employing an electrode to deliver the active agent to a subject. For example, an electrode may be used that has a small port at its tip which is connected to a reservoir or pump containing an active agent. The active agent delivery electrode may be implanted using any suitable technique such as surgical cut down, laproscopy, endoscopy, percutaneous procedure, and the like. In certain embodiments a reservoir or pump may also be implanted in the subject's body. The active agent delivery electrode, or other analogous device, may be controllable such that the amount of active agent delivered, the rate at which the active agent may be delivered, and the time period over which the active agent may be delivered, etc., may be controllable and may be adjusted, e.g., by a user and/or healthcare worker. Accordingly, embodiments include contacting an analyte determination site with an active agent or agents, and determining the concentration of an analyte, where the contacting may be by way of an analyte sensor or other structure, transdermal administration, parenteral administration, etc. As described above, analyte sensors may include active agents. The sensors may include or incorporate active agents thereof in any suitable manner. At least a portion of the sensor (and/or other structure), e.g., a bodily fluid-contacting portion, includes active agents, and in certain embodiments substantially the entire sensor may include the active agent. Active agents may be immobilized on a surface of the sensor or may be configured to diffuse away from the sensor surface. In certain embodiments, the active agent is a coating on at least a portion of the sensor, such as proximate to or directly on the working electrode and/or reference/counter electrode, on the sensing layer, on the flux-limiting membrane. In certain embodiments, the active agent is incorporated, e.g., embedded, or otherwise integrated into the sensor, such as the sensing layer formulation, the redox polymer formulation, the flux-limiting membrane formulation. As will be described in greater detail below, an analyte sensor may include a matrix component such as a membrane. The membrane may be, for example, a mass transfer limiting membrane. In certain embodiments, the membrane may include the active agent such that the membrane may include a coating thereof such that the active agent may be incorporated as a thin coating positioned about a surface of the membrane, e.g., a fluid contacting surface. The amount of active agent to be included may be readily controlled by applying multiple thin coats thereof, e.g., and allowing it to dry between coats. Alternatively or in addition to a coating, an active agent may be incorporated within the material of the sensor, e.g., incorporated within the material of a sensor membrane itself, the sensing layer of the working electrode, the redox polymer, the flux-limiting membrane, and the like. For example, membranes are often applied to a sensor via a spraying or dipping process, wherein the membrane material is dissolved in a solvent and the resulting solution is applied to the sensor substrate. In this case the active agent may simply be co-dissolved with the membrane material in the solvent. This results in a sensor with active agent dispersed evenly throughout the sensor membrane. The sensors may also have the ability to emit or diffuse an active agent at a controllable rate, e.g., may include a controlled release, such as a time release, formulation. For example, a sensor (e.g., a membrane of the sensor) may include a formulation that is designed to release an active agent gradually over time, e.g., over about a period of time commensurate with a period of time in which a sensor exhibits spurious low glucose readings post-sensor insertion, e.g., about 1 hour to about 24 hours in certain embodiments. A controlled release formulation may employ a polymer or other non-antiglycolytic agent material to control the release of the active agent. The active agent release rate may be slowed by diffusion through the polymer, or the antiglycolytic agent or precursor may be released as the polymer degrades or disintegrates in the body. The active agent may be added to the sensor during fabrication of the sensor and/or may be applied to the sensor after it has been fabricated. For example, a coating containing an active agent or agents thereof may be applied to the sensor after it has been fabricated. Active agents may be applied to the sensor by any of a variety of methods, e.g., by spraying the active agent onto the sensor or by dipping the sensor into the active agent, by coating the active agent with a slotted die, or otherwise immersing or flooding the sensor with the active agent. In addition, the active agent may be incorporated into the sensing layer formulation, or redox polymer formulation, the flux-limiting membrane forumation. The analyte sensors and analyte monitoring systems of the embodiments of the invention may be utilized under a variety of conditions. The particular configuration of an antiglycolytic and chelating agent stabilizer sensor and other units used in an analyte monitoring system may depend on the use for which the sensor and system are intended and the conditions under which the sensor and system will operate. As noted above, embodiments include a sensor configured for implantation into a patient or user. The term “implantation” is meant broadly to include wholly implantable sensors and sensors in which only a portion of which is implantable under the skin and a portion of which resides above the skin, e.g., for contact to a transmitter, receiver, transceiver, processor, etc. For example, implantation of the sensor may be made in the arterial or venous systems for direct testing of analyte levels in blood. Alternatively, a sensor may be implanted in the interstitial tissue for determining the analyte level in interstitial fluid. This level may be correlated and/or converted to analyte levels in blood or other fluids. The site and depth of implantation may affect the particular shape, components, and configuration of the sensor. Subcutaneous implantation may be desired, in some cases, to limit the depth of implantation of the sensor. Sensors may also be implanted in other regions of the body to determine analyte levels in other fluids. Examples of suitable sensors for use in the analyte monitoring systems of the invention are described in U.S. Pat. Nos. 6,134,461 and 6,175,752. An exemplary embodiment of an analyte monitoring system 40 for use with an implantable antiglycolytic sensor 42, e.g., for use with a subcutaneously implantable antiglycolytic sensor, is illustrated in block diagram form in FIG. 1. Said analyte monitoring system may optionally include borate minerals or boric acid or any precursor thereof. The analyte monitoring system 40 includes, at minimum, a sensor 42 that includes an antiglycolytic agent or precursor thereof, a portion of the sensor which is configured for implantation (e.g., subcutaneous, venous, or arterial implantation) into a patient, and a sensor control unit 44. The antiglycolytic sensor 42 is coupleable to the sensor control unit 44 which may be attachable to the skin of a patient. The sensor control unit 44 operates the sensor 42, including, for example, providing a voltage across the electrodes of the sensor 42 and collecting signals from the sensor 42. The sensor 42 includes an antiglycolytic agent or precursor thereof and a chelating agent, including boric acid or borate minerals, as described herein, and includes at least one working electrode 58 and a substrate 50, as shown for example in FIG. 2. The sensor 42 may also include at least one counter electrode 60 (or counter/reference electrode) and/or at least one reference electrode 62 (see for example FIG. 7). The counter electrode 60 and/or reference electrode 62 may be formed on the substrate 50 or may be separate units. For example, the counter electrode and/or reference electrode may be formed on a second substrate which is also implantable in the patient or, for some embodiments of the sensors the counter electrode and/or reference electrode may be placed on the skin of the patient with the working electrode or electrodes being implanted into the patient. The use of an on-the-skin counter and/or reference electrode with an implantable working electrode is described in, e.g., U.S. Pat. No. 5,593,852. At least one conductive trace 52 may be formed on the substrate for use in constructing a working electrode 58. In addition, other conductive traces 52 may be formed on the substrate 50 for use as electrodes (e.g., additional working electrodes, as well as counter, counter/reference, and/or reference electrodes) and other components, such as a temperature probe. The conductive traces 52 may extend most of the distance along a length 57 of the sensor 50, as illustrated in FIG. 2, although this is not necessary. The conductive traces may be formed using a conductive material 56 such as carbon (e.g., graphite), a conductive polymer, a metal or alloy (e.g., gold or gold alloy), or a metallic compound (e.g., ruthenium dioxide or titanium dioxide), and the like. Conductive traces 52 (and channels 54, if used) may be formed with relatively narrow widths. In embodiments with two or more conductive traces 52 on the same side of the substrate 50, the conductive traces 52 are separated by distances sufficient to prevent conduction between the conductive traces 52. The working electrode 58 and the counter electrode 60 (if a separate reference electrode is used) may be made using a conductive material 56, including carbon. The reference electrode 62 and/or counter/reference electrode may be formed using conductive material 56 that is a suitable reference material, for example silver/silver chloride or a non-leachable redox couple bound to a conductive material, for example, a carbon-bound redox couple. The electrical contact 49 may be made using the same material as the conductive material 56 of the conductive traces 52, or alternatively, may be made from a carbon or other non-metallic material, including a conducting polymer. An interferant-eliminating layer (not shown) may be included in the sensor 42. The interferant-eliminating layer may include ionic components, such as, for example, NAFION or the like, incorporated into a polymeric matrix to reduce the permeability of the interferant-eliminating layer to ionic interferants having the same charge as the ionic components. The subject invention also includes sensors including an antiglycolytic agent and a chelating agent, which sensors are used in sensor-based drug delivery systems. The system may provide a drug to counteract the high or low level of the analyte in response to the signals from one or more sensors. Alternatively, the system may monitor the drug concentration to ensure that the drug remains within a desired therapeutic range. The drug delivery system may include one or more (e.g., two or more) sensors, an on-skin sensor control unit, a receiver/display unit, a data storage and controller module, and a drug administration system. In some cases, the receiver/display unit, data storage and controller module, and drug administration system may be integrated in a single unit. The sensor-based drug delivery system uses data form the one or more sensors to provide necessary input for a control algorithm/mechanism in the data storage and controller module to adjust the administration of drugs. As an example, a glucose sensor could be used to control and adjust the administration of insulin. The following examples are put forth so as to provide those of ordinary skill in the art with a complete disclosure and description of how to make and use the embodiments of the invention, and are not intended to limit the scope of what the inventors regard as their invention. Efforts have been made to ensure accuracy with respect to numbers used (e.g. amounts, temperature, etc.) but some experimental errors and deviations should be accounted for. Unless indicated otherwise, parts are parts by weight, molecular weight is weight average molecular weight, temperature is in degrees Centigrade, and pressure is at or near atmospheric. FIG. 16 shows that even modest amounts of an antiglycolytic agent, included into a glucose sensor, can greatly retard, if not minimize, glucose consumption by a blood clot which surrounds the sensor. Antiglycolytic sensors were prepared by modification of control sensors (FREESTYLE NAVIGATOR®) as follows. A coating solution was prepared from 250 mg/mL of a racemic mixture of L-glyceraldehyde and D-glyceraldehyde, and 150 mg/mL in polymer PC-1306 (Biocompatibles, PLC), the former suspended and the latter dissolved in ethanol. The resulting antiglycolytic sensors had approximately 138 micrograms of the racemic mixture of D- and L-glyceraldehydes incorporated as a thin, outer coating. Both these sensors and control sensors (no antiglycolytic agents added) were then inserted into blood clots, and the current response was followed over time. A further example of the use of an antiglycolytic sensor is provided by its use in an in vivo environment. In this example, a control sensor (FREESTYLE NAVIGATOR®) is inserted in the arm of a non-diabetic subject, adjacent to a similar sensor, which has been modified by the addition of an antiglycolytic agent, L-glyceraldehyde. A coating solution was made 200 mg/mL in L-glyceraldehyde, and 150 mg/mL in polymer PC-1306 (Biocompatibles, PLC), both dissolved in ethanol. The FREESTYLE NAVIGATOR® sensor was then modified by dipping twice into this coating solution, yielding an overcoat containing about 55 micrograms of L-glyceraldehyde. An example of the use of an antiglycolytic sensor containing borate minerals, boric acid or any precursor thereof, is provided by its testing in an in vitro environment. 50 mg/ml boric acid was mixed with 150 mg/ml L-glyceraldehyde and 150 mg/mL PC in 100% ethanol. The sensor was dipped three times with a 10 minute interval. The sensor was then cured overnight, and subjected to stress at 56° C. for nine days and subsequently tested in nonheparin blood. FIG. 18 shows that the high background current is reduced significantly by adding borate to the formulation. While embodiments of the invention have been described with reference to the specific embodiments thereof, it should be understood by those skilled in the art that various changes may be made and equivalents may be substituted without departing from the true spirit and scope of the invention. In addition, many modifications may be made to adapt a particular situation, material, composition of matter, process, process step or steps, to the objective, spirit and scope of the present invention. All such modifications are intended to be within the scope of the claims appended hereto. an antiglycolytic agent or precursor thereof and a chelating agent that stabilizes the antiglycolytic agent or precursor thereof, wherein the antiglycolytic agent or precursor thereof and the chelating agent are disposed proximate to the working electrode. 2. The sensor of claim 1, wherein the antiglycolytic agent is fluoride, glyceraldehyde, mannose, glucosamine, mannoheptulose, sorbose-6-phophate, or trehalose-6-phosphate. 3. The sensor of claim 1, wherein the antiglycolytic agent is a glyceraldehyde or a precursor thereof. 4. The sensor of claim 1, wherein the chelating agent is boric acid. 5. The sensor of claim 1, wherein the chelating agent is a transition metal. 6. The sensor of claim 3, wherein the glyceraldehyde or precursor thereof is present in an amount that ranges from about 1 microgram to about 2 milligrams. 7. The sensor of claim 4, wherein the boric acid is present in an amount that ranges from about 1 microgram to about 2 milligrams. 8. The sensor of claim 1, wherein the sensor further comprises a membrane disposed over the sensing layer. 9. The sensor of claim 8, wherein the membrane comprises the antiglycolytic agent or precursor thereof and the chelating agent. 10. The sensor of claim 9, wherein the antiglycolytic agent is a glyceraldehyde or precursor thereof. 11. The sensor of claim 9, wherein the chelating agent is boric acid. 12. The sensor of claim 9, wherein the chelating agent is a transition metal. 13. The sensor of claim 9, wherein the antiglycolytic agent a precursor thereof and the chelating agent are disposed on a surface of the membrane. 14. The sensor of claim 9, wherein the antiglycolytic agent or precursor thereof and the chelating agent are incorporated into the membrane. 15. The sensor of claim 1, wherein the antiglycolytic agent or precursor thereof and the chelating agent are comprised in a time-release formulation. 16. The sensor of claim 1, wherein the antiglycolytic agent precursor further comprises an enzyme. 17. The sensor of claim 16, wherein the enzyme is trehalose-6-phosphate synthase. 18. The sensor of claim 1, wherein the sensing layer of the working electrode comprises a glucose-responsive enzyme. 19. The sensor of claim 1, wherein the sensing layer comprises a redox mediator. 20. The sensor of claim 19, wherein the redox mediator comprises a complex selected from the group consisting of a ruthenium-containing complex and an osmium-containing complex.